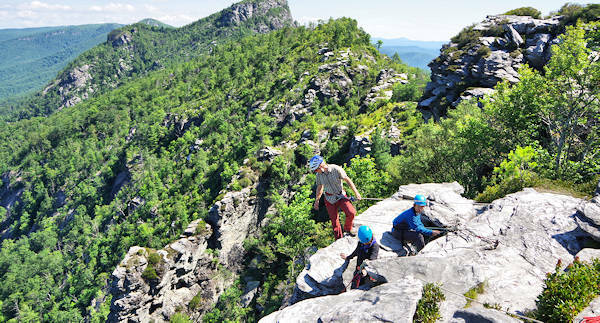 A great way to experience the rugged Linville Gorge is to hike among the Chimneys, dramatic rock formations along the canyon rim. 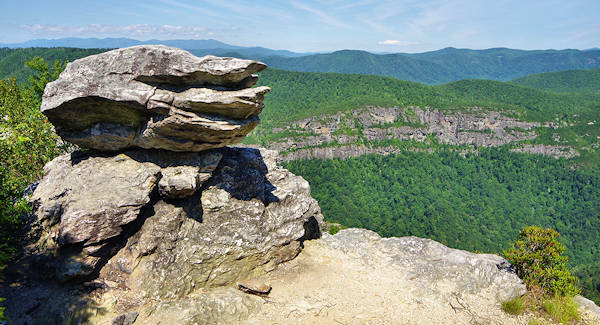 It's an easy 1.5-mile roundtrip hike that starts at the Table Rock Mountain parking area. The trail is a roller coaster, taking you over some chimneys and around others for spectacular views. This section follows the Mountains-to-Sea trail. So you can easily extend your hike. 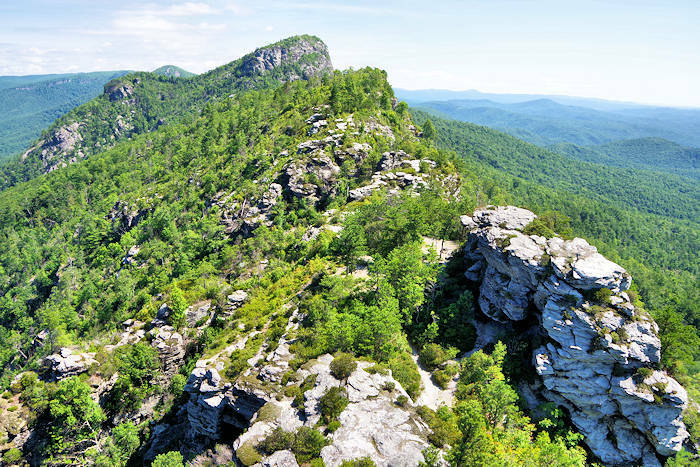 While you are there, hiking to the top of Table Rock is a must! Or you can continue beyond the Chimneys to reach Shortoff Mountain (5.6 miles from parking area). The parking area has restrooms and a picnic area. The first part of the trail goes through a popular camping area with primitive campsites with fire pits. So it's a great spot for backcountry camping that's a short walk from the car! After a half mile gradual uphill section, you'll reach the first stone outcroppings on the left. Detour to walk across the boulders for a look-back at the Table Rock summit (pic above). For those afraid of heights, this may not be the best trail. Also, it's not a good choice for children since one slip off the cliffs can be deadly. Keep going to see larger chimneys in about a quarter of a mile, with spectacular views on each side of the ridgetop trail. It's a geologist dream since you can get a close-up view of the 1-billion year history of the gorge formation. Following the main trail is tricky in the Chimneys area since there are many side trails used by rock climbers. Look for the white blazes. If you take a side trail to the some of the chimney tops, just note how to get back to the side trail. But since there are few trees, you can usually see how to maneuver back. Some tips: Watch out for anchor rings in boulders for rock climbing - tripping hazards. Since there are few trees and a lot of stone, be sure to wear your sunscreen and take water. Summer afternoons can be sweltering when the rocks heat up. Don't hike here during thunderstorms or high winds. This area is closed January-March and avoid during other winter months if any snow or ice. 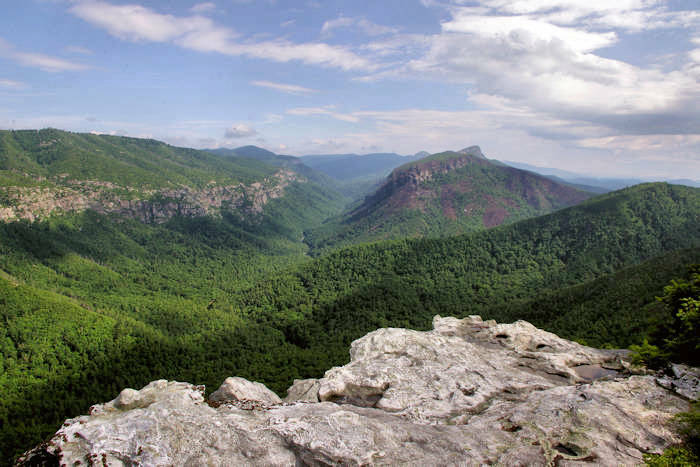 Driving Directions: The Table Rock Mountain parking area is about 70 miles from Asheville. The shortest route is via I-40 east to Marion. 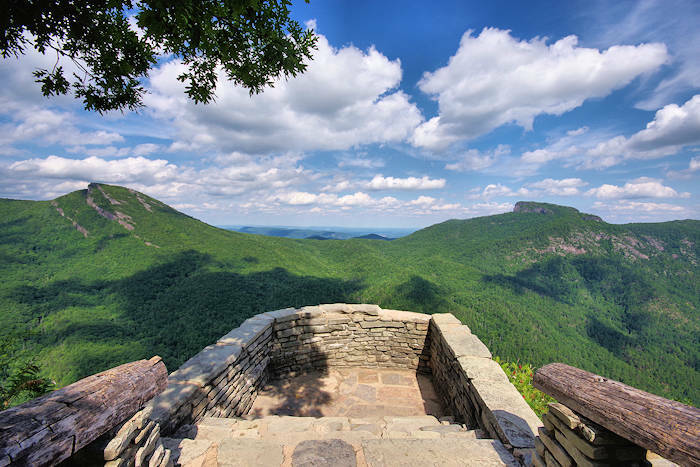 Then U.S. Highway 221 north to the Linville Falls area, then Highway 183 to Highway 181. Go south three miles on Highway 181 to Gingercake Road (the second intersection with Gingercake Rd). 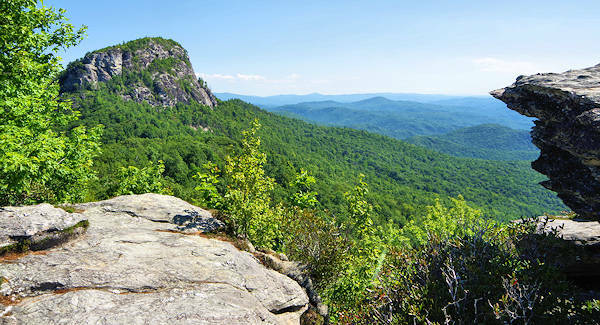 It's about four miles south of the Blue Ridge Parkway intersection with Highway 181. One half mile down Gingercake Rd, stay left (follow Table Rock sign) on road 1264. The pavement ends in a mile. Go another 7 miles on the unpaved bumpy road to reach the Table Rock Mountain parking area (go slow and enjoy car hiking through the forest). The last 1.5 miles is paved but steep! It's open April-December (the road near the summit is closed January-March). 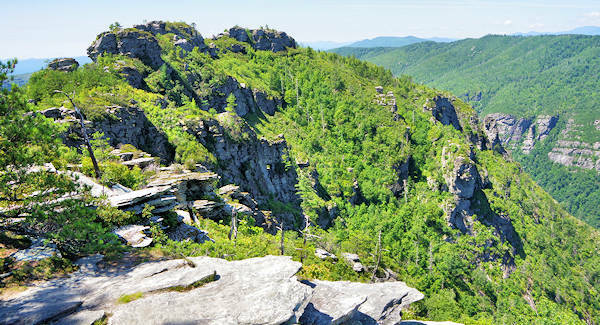 Read more about Linville Gorge and Table Rock Mountain hike.